FreeCen – searchable database of transcripts from the 1841 to 1891 Census for England and Wales. Gives all the information held on the census record (but doesn’t show the actual handwritten census form). A very useful site that lets you search for ancestors without having to pay a subscription, though it is not as complete as the paid for sites. 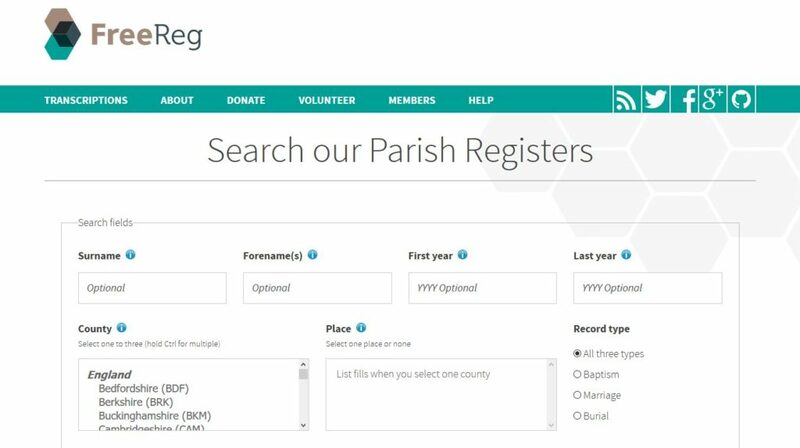 FreeReg – free transcritps of parish registers for baptism, marriage and funeral records around the UK. Along with FreeBMD and FreeCen, FreeReg is part of Free UK Genealogy. Rootschat – Genealogy forum that is a great place to get advice on any aspect of your genealogy search, from help with handwriting and restoring old photographs to country and county specific help. This a friendly, active community and there is generally someone willing to help you. Although this a UK centric forum, it does also cover the rest of the world. Public Records Office of Northern Ireland – contains a searchable database of wills, lists of land freeholders and more. If you find the document you’re looking for you can view a transcript and the original document online for free. GenUKi – a free index of towns and villages in the UK, Ireland, Isle of Man and the Channel Islands, including details of their churches and graveyards and where their records are stored. These are sites that I’ve found useful. Lancashire Online Parish Clerk – transcripts of parish records from Lancashire (the old county of Lancashire, including Greater Manchester, Merseyside, Cheshire and parts of Cumbria and Cheshire. Lancashire Births Marriages and Deaths records transcripts from 1837 to 1999 for births, 2013 for marriage and 2000 for deaths, being added to all the time. North Wales Births Marriages and Deaths records transcripts from 1837 to 1995 for births, 2005 for marriages and 1996 for deaths, being added to all the time. Amlwch Data – transcripts of parish records, along with census transcripts (including an Amlwch census of 1801), details about the Parys Mountain Copper Mine and the miners, old photographs and much more. An extremely useful site if you have any ancestors from the area. Royal and Merchant Navy Records available to view for free on the National Archives Website. Family Search – free to search and view the basic transcripts of any results. To view the actual documents you’ll need to visit and subscribe to their partner sites which in the UK is most often Find My Past. Billion Graves – free database of grave headstone images from around the world. Sligo County, Ireland – contains information about the area, including census data, churches, letters and diaries, maps and more. There is also a section containing the parish records from the Castleconnor area from 1835 to 1880. Irish Census – The Irish National Archives have released all the census data they hold and placed it online for free. The censuses covered are the complete 1901 and 1911 census, along with surviving fragments of the 1821 to 1851 censuses. Irish National Archives – along with the census information, the National Archives also hold Tithe Applotment Books for 1823 to 1837, Will and Administration which include names, dates and places of death and soldiers’ wills mainly from WW1. Old Maps Online – Old maps from around the world. You can search for a specific town or city which is great help in pinpointing where your ancestors lived. History Pin – view old photos and stories from around the world, add some context to the data you find about your ancestors. Hall Genealogy Old Occupations – while this is primarily a website dedicated to the history of one family, it also has a fantastic section on old occupations which is very useful when you’re stuck trying to decipher handwriting on an old document. Find My Past, Ancestry and Genes Reunited – all are subscription based genealogy sites, both have pros and cons which are really a matter of personal taste. I find Ancestry easier to search and prefer their family trees but for where my ancestors came from (Lancashire and North Wales) Find My Past seems to have more parish records, though Ancestry also has a wealth of them. It’s really a case of trying both and seeing which works better for you. Deceased Online – searchable database of burial records from around the UK, with more records being added all the time. It’s free to search and to see very basic transcripts of the results but to view the actual documents you’ll need to pay from between £1.50 for the grave details, £2 for a burial record and £2.50 for a map of the grave location. Payment can either be in vouchers starting at £5 or by subscription. I’ll update these lists as I find more sites.